I’ll Dance On The Ashes … When They’re Cool Enough! | What Would The Founders Think? 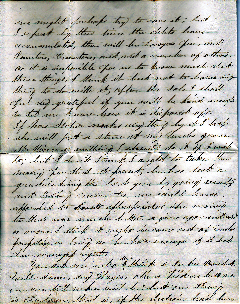 The year was 1877 and Lizzie Pierce was writing to her good friend Mrs. McCarty McCauley in Schenektety, NY. It was January and the election of 1876 was still unresolved. Rutherford B. Hayes of Ohio and New York’s Samuel J. Tilden were in contention for the highest office in the land. It was, and is still one of the most disputed and controversial presidential elections in American history. There were twenty electoral votes in dispute in three states: (Florida, Louisiana, and South Carolina). Tilden had 184 electoral votes to Hayes’s 165. Each side contended that their candidate had won in these states. As a transplanted northerner, Lizzie supported Hayes. 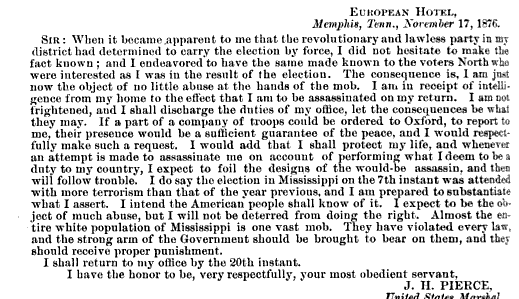 Her spidery handwriting is sometimes difficult for the modern eye to make out, but the reader gets a good sense of what life was like in Oxford, Mississippi for a northern carpetbagger, as reconstruction was drawing to a close. 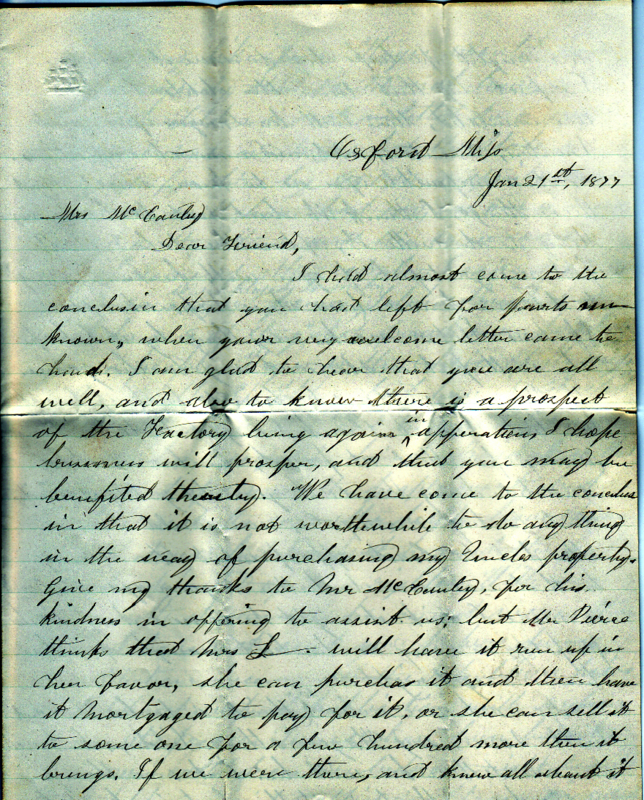 As was common in her time, Lizzie referred to her husband in formal style, calling him Mr. Pierce, throughout the letter. You ask me who we think to be President. Well, some say Hayes, others Tilden, but no one can tell who it will be, but one thing is certain, that is, if the election has been anything like fair Hayes would have a majority that could not have been disputed. Tilden is not entitled to a single electoral vote in Mississippi, but the state is claimed for him by 65,000 majority. They may as well have had 100,000, one is as near correct as the other. Not the same can be said as other ?? easier not without means is employed to make Tilden president. It will be one of the greatest frauds ever perpetrated upon a people. Hayes is the choice of the majority. Much as I dislike the man, but as I believe him to be, I say let him be president if that is the kind of a man the people want. But such is not the case. Some of the people have chosen a good man but I expect he and the people will be defaulted of their rights. We’ll know in the south it cannot be much more than it is. I have not sent you papers ??? the election because all the republican papers that did not suspend publication with the exception of one (The Jackson Times) have been burnt. We were called from our beds one night to see the republican printing office in flames. Mr. Pierce had a half interest in it, like all the rest was said to be an accident (but the town is small) and the watchmen were requested to patrol the streets all night and the alarm, as before, was not given until the roof had fallen in. Not an article was saved and stranger still, not one of the democratic offices have been burned. And there were two to one of the republicans. I do not hesitate to say, I believe it to be the work of the Tilden reformers for it is in perfect harmony with the rest of their work. Our yard has been ??? a number of times and bullets came through the window. It was night and we were all in bed but never hurt. Just after the election, about three weeks this place ???? Mr. Pierce left home thinking he could hear the results of the election in Memphis more correctly, and sooner than here. When they thought Tilden was elected they formed a mob and …. I soon found out what was up and sent word to him not to return until I sent for him. ….. So, who was Mr. Pierce? James H. Pierce was a United States Marshall. 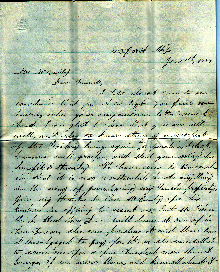 This telegram sent to the Attorney General of the United States, Alphonso Taft (father of President William Howard Taft) substantiates what Lizzie describes in her letter. Lissie’s attempts to take matters before the local civil authorities didn’t meet with much success. One gets the feeling that they weren’t too sympathetic. He admitted that there was a class of men in Oxford that could not be regarded in any light other than a mob, but said the better class would not submit to malfeasance. I cited five instances of what I called violence and the better class, as they call it, did not interfere until it was too late. I also told him that by their silence they gave their consent and other facts I brought before him. I heard since that he and some others have come to the conclusion that I am match for them and Mr. Pierce knows how to take care of himself and that the best they could do was leave us alone. In a few days I was told that Mr. Pierce should not be molested and the best of the citizens would stand by him. I sent for him to come home just still keeping my guards on duty. He came an hour ?? than expected and no one came to meet him at the train, but friends. 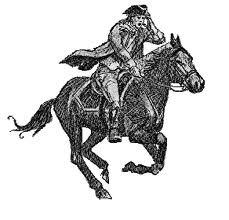 He is now in Washington having been summoned to appear before the committee in regard to the election. Don’t you think I had a fine time by myself? I did not take off my clothes at night for three weeks. I expected almost every night the house would be fired. I would sit up until five o’clock and about that time the rabble would seem to get tired and leave, but were always clear by daylight. They had a little cannon they kept a working until it burst its throat. All of ?? ?? I have not heard it since. I have been told that the reason they did not burn the house was that if Tilden was president they could drive us off and it was a pity to destroy a good house. I still hear some complaints that if we do not leave, they will still burn, I will tell them to burn away and I will dance on the ashes as soon as they are cool enough! Others have had this same threat and I believe I can endure as much persecution as anyone. Most of the white republicans have left the state. Some had their homes burnt over them and lost everything, others taken from their houses and beaten fearfully. A friend of ours came to our house, his head cut in several places, his house had been burnt and he had fled for his life. I could relate many such cases, but I have already tested your patience. The papers never mention these things and others dare not speak. But this is what the southern democrats call Tilden reform. I hope we shall get away from here. Sometimes Mr. Pierce says it is no time to desert when the party is in troubles. In the end, Lizzie got the candidate she wanted, but probably not the result she was looking for. It is generally believed that an informal deal was struck to resolve the dispute: the Compromise of 1877. In return for the Democrats’ acquiescence to Hayes’s election, the Republicans agreed to withdraw federal troops from the South, ending Reconstruction. The Compromise effectively ceded power in the Southern states to the Democratic Redeemers. Lizzie and her husband probably left pretty quickly after this. I submit to Congress whether this measure is not in its whole character, scope, and object without precedent and without authority, in palpable conflict with the plainest provisions of the Constitution, and utterly destructive to those great principles of liberty and humanity for which our ancestors on both sides of the Atlantic have shed so much blood and expended so much treasure. I come now to a question which is, if possible still more important. Have we the power to establish and carry into execution a measure like this? I answer, Certainly not, if we derive our authority from the Constitution and if we are bound by the limitations which it imposes. Johnson’s question and answer have an eerie relevance to the present. Blatant violations of the Constitution did not originate with the 111 Congress. Congressional over-reach has long and dishonorable history. Reconstruction in practice was a military occupation and a license to steal for the unscrupulous carpetbagger. Even if she was as honest as a saint, being the wife of a U.S. marshal I wouldn’t suspect Mrs. Pierce was the most popular of neighbors. The collector took a certain amount of delight in the fact that Lizzie didn’t get exactly what she wanted. 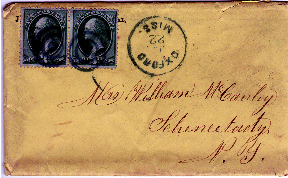 Can you tell me the date of the fascinating letter from Mrs. Pierce and who presently possesses it? A collector friend of mine has the letter. Click on the letter above and you can read the date.